For the Crust: Preheat the oven to 300 degrees F.
In the bowl of a food processor, add the shredded coconut, almond flour, coconut oil, agave and salt. Pulse the dough to blend well. 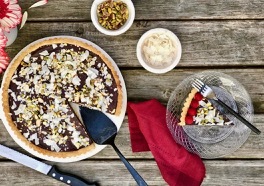 Using a 9-inch tart pan, gently press the dough firmly onto the bottom and around the sides of the tart pan. Note: After I press the crust in place, I like to use a drinking glass to gently press down on the bottom of the crust for a nice even surface. Refrigerate the crust for about 15 minutes to set. Once the crust has rested, place on a baking sheet and bake for 15 minutes until set and beginning to brown on the top edges. Remove from the oven and allow to cool. Meanwhile work on the filling. For the Chocolate Filling: Place the chopped chocolate in a medium mixing bowl and set aside. In a small saucepan add the coconut milk and place over a low flame. Heat the coconut milk until it’s just about to simmer. Remove front the heat and pour over the chopped chocolate. Allow to sit for a few minutes to melt. Using a rubber spatula, stir the chocolate until smooth. Add the vanilla extract, coconut extract and salt. Mix well to incorporate. Pour the chocolate filling into the cooled tart shell. Use a rubber spatula to even out the filling as best as possible, it will not be perfect and that is fine. Allow the tart to set for at least 2 hours. 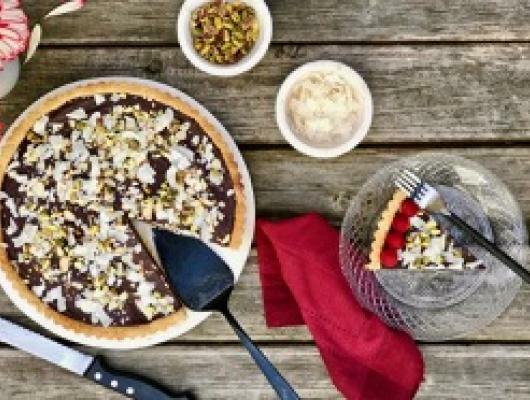 Before serving, sprinkle the top of the tart with the chopped pistachios, coconut chips, sliced almonds and some flaky salt.